Image from my Twitter feed. Spend all day texting back & forth about what we need to buy. Create a list on crappy scrap paper or rogue post-it note. Crumple paper & smash into pocket. Lose crumpled list en route to grocery store. Buy whatever we can remember, but forget 5 things that we didn’t even think to include on the original list because we didn’t have a system for recording things as soon as we ran out of them. Return to store & repeat entire process. First world problems, right?? Well, now there’s a solution. If you haven’t tried this yet, prepare to have your mind BLOWN. Or mildly amused. Your choice. Add things to the shopping list as soon as we think of them/run out. Buy everything we need quickly & efficiently. 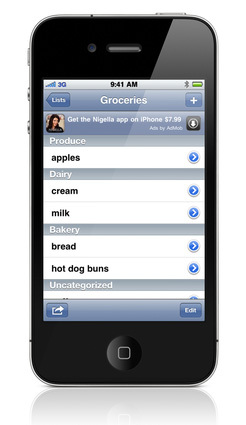 You can create multiple shopping lists, so you could have one list specifically for certain grocery stores, one for the hardware store, etc. When we go shopping, we can divide & conquer. OurGroceries syncs all of the devices connected to your account, so any items checked off the list on one phone will automatically update on the other. Simplified meal planning: you can save recipes on your app & then when you plan your meals, just tap the recipe & it will add all of the ingredients you need to purchase! It even lets you save time at the store by arranging items so that they’re in the order of your store’s layout! You can even separate items by aisle or category! Check out the rest of their features on the OurGroceries website! Wanna save even MORE time? Check out these online grocery shopping tips! Have you found any apps that make your life easier? P.S. I wasn’t paid or perked in any way to recommend this app. I just love it to death & thought maybe you guys would love it, too! Love that app! DH has a dumb phone so doesn’t participate. I have lists for my two favorite grocery stores plus Target/Walmart and Home Depot/Lowes. I also have a list for everyone in the family where I add Christmas present ideas. My final list is called “Today” and list all my chores and errands for the day. This app really clicked with me. Oooh, I love how you’re using it in so many different ways!! The “Today” list is just brilliant! Thanks for sharing!! I absolutely love lists, so I downloaded this app right away and am loving it so far! Thanks for sharing! Yay!! Glad you like it! If you have any other favorite lists or apps, please feel free to share — I love them, too! !